You loved, it, you can take it home ! 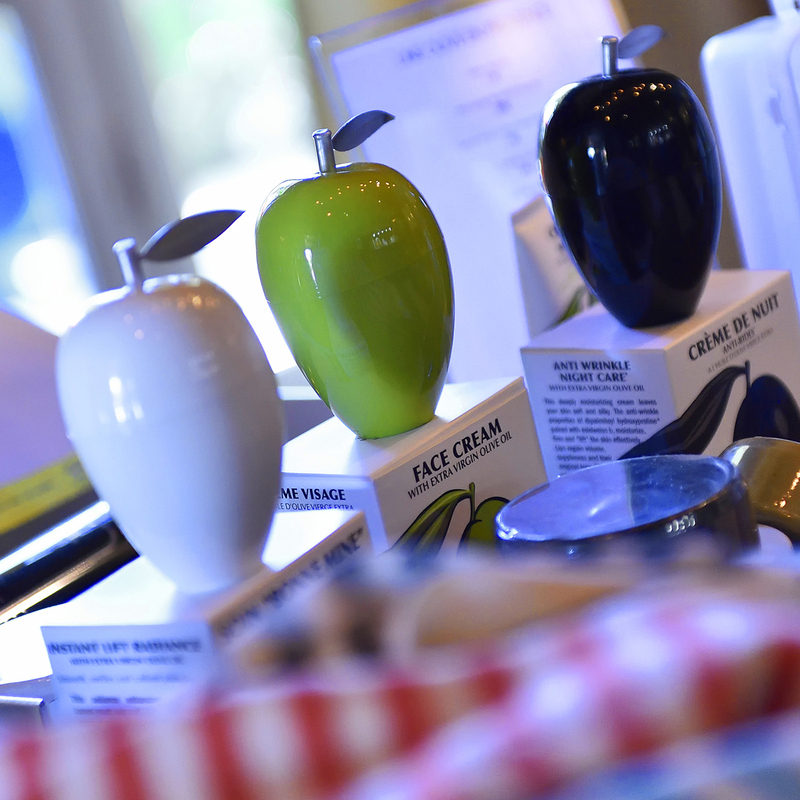 Make you stay at le Hameau last longer with a different shopping experience. 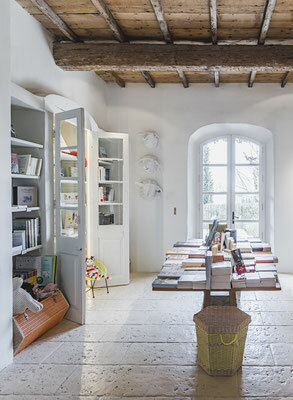 The hotel’s boutique, Le Comptoir du Hameau displays an arty, smart, local and made in France selection. How can you make Hameau’s bliss last longer? Take a piece of this magical place back home! Not only Monolithe édition and Monolithe vintage exclusive furniture are available for order, but the Comptoir, Hameau’s concept store, offers a vast choice of goodies to offer or –even better- to keep for yourself. 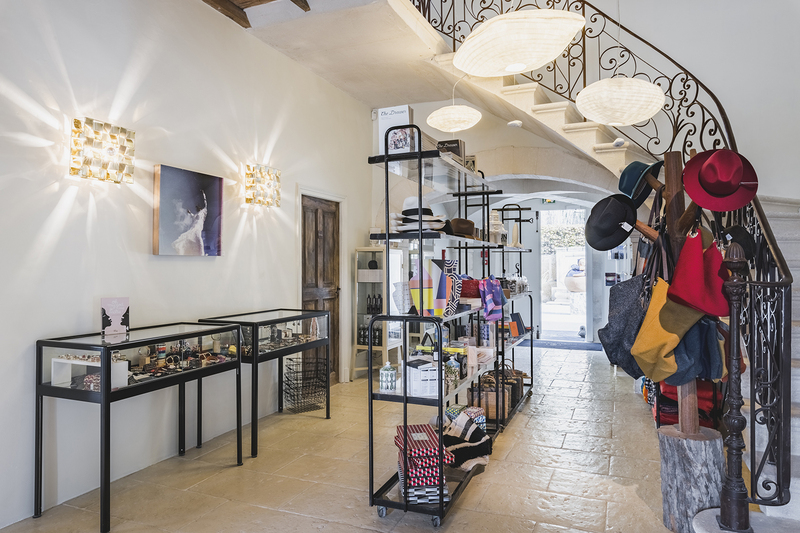 Like the five-star hotel, it’s a different, original, natural, local and cultural kind of shopping. Hameau’s extra virgin oil, soon to be organically certified, is a best seller of the boutique. It is pressed by Saint Jean Mill, in Fontvieille, and made from Blanquette, Salonenque and Verdale olives, all local varieties. Its fruity green and rates only a 0,3% acidity, while most extra virgin oils are at a mere 0,8% acidity rate. It is to be enjoyed as simple a few drops in a salad or a focaccia, as an appetizer. Design lovers can pair their bottle of olive oil with a taste-oil plate, designed for the Hameau by Pierre Dubourg, who also created Monolithe edition’s indoor-outdoor Hansel and Gretel tables. The room’s amenities are for sale at le Comptoir. Local brands Végétalement Provence and its range shave and skincare 100% organic or Une Olive en Provence also proposes beauty creams handsomely presented in olive-shaped little jars, either white, black or green, thus emphasizing on the natural ingredients they contain. 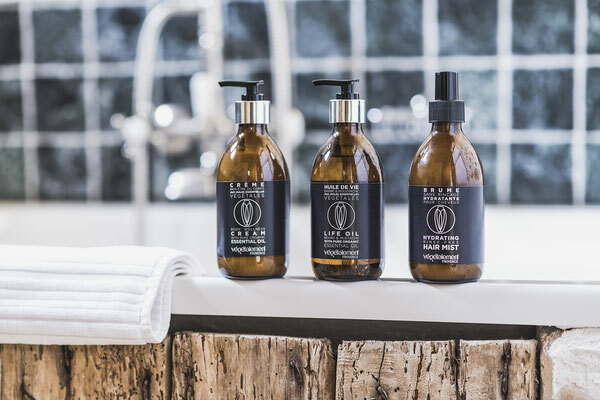 Fragrance brand Thirdman also created a few specific items for le Hameau : a choice of scented candles, name after the hotel’s ambiance according to the time of the day. 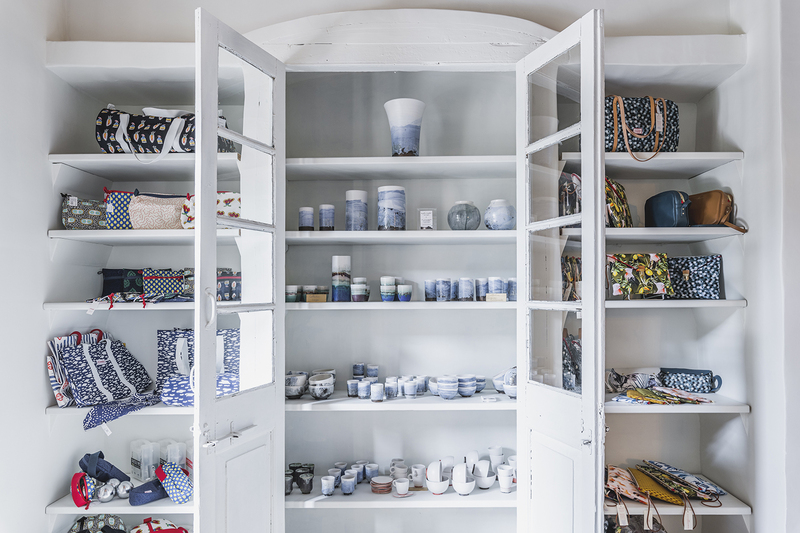 Always willing to showcase local savoir-faire, the Comptoir displays printed cottons by Olivades on a specific corner. Named “indiennes”, because they were originally made in India, these printed cottons were very popular during the second half of XVI century, but the industry collapsed after several royal backlashes, only to live again around the year 1800. Olivades was born in 1818 in Saint Etienne du Grès, and is lead today by the Boudin Family. They make the tradition live on while perpetuating the print of timeless tradition patterns but also involving top notch designers, such as Nathalie du Pasquier, a former member of Ettore Sottsass Memphis movement –and herself a descendant of cotton “Indienne” makers from Switzerland. For Olivades, she created the Arella collection, a mix of Provence’s traditional patterns with African wax, in bright colors, for a joyous, graphic and edgy result. Olivades also showcases younger talents such as Joran Briand whose patterns are inspired by the ocean waves, and Antoine Boudin, grandson of Olivades’ creator. He went through the house’s archives to remix in a fresh and edgy way the traditionals patterns, creating the Auro collection. All these creations are available as tote bags, weekend bags, wallets and purses, and even hip pétanque balls bags. 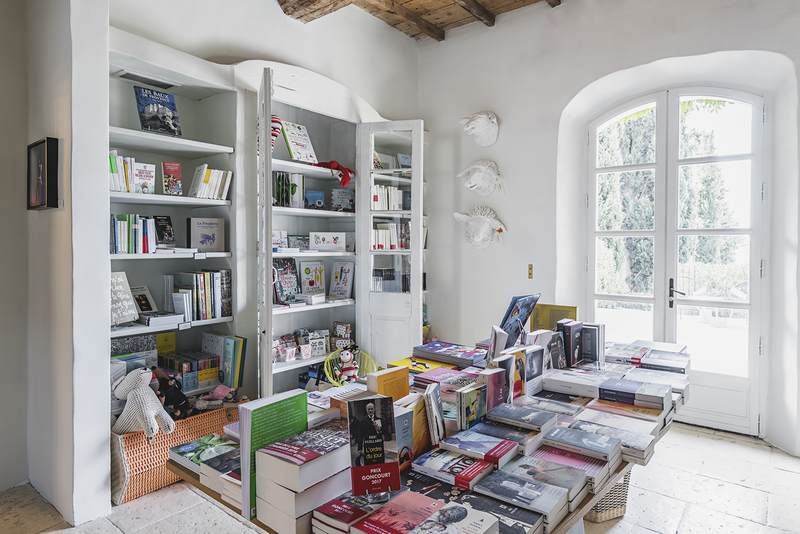 Another local must is the publishing house Actes Sud, which has its own space at le Hameau, with 300 references for adults and children. This publishing house, founded in Arles in 1978 by Hubert et Françoise Nyssen (currently the French secretary of state for culture) received the prestigious literary Goncourt prize in 2017 with L’ordre du Jour, by Eric Vuillard, but it is through the Millenium series, by Stieg Larsson, that Actes Sud became famous. Among the kids’ selection feature a few gems, such as L’encyclopédie des Mamies by Eric Veillé, (grandmas’ encyclopedia) or the fun and informative Yôkai ! Le monde étrange des monstres japonais by Fleur Daugey et Sandrine Thommen (the strange world of Japanese monsters). Novelwise, a 2018 best pick is definitely new Paul Auster’s 4321, a fascinating literary paper chase leading us to discover the whereabouts of Archie Fergusson, whose life sometimes merges with the author’s. A breathtaking come-back after seven years of absence for a cult novelist. Another highly anticipated novel is Carlos Ruiz Zafón, Le labyrinthe des esprits, a follow up of L'ombre du vent. Truly the best way to spend the summer: with a book as a best friend. The Hameau has a special relationship with leather goods company and decorator Maison Baluchon. This fine house, located in Haute Marne, near the champagne region, decorated the Calade suite in a cosy and contemporary mind set, mainly in peacock blue. A few items featuring the same patterns as those used in the suite are for sale at The Comptoir: suitcases, weekend bags, pouches, Ipads cases… Just a few ideas for a fancy “made in France” present. 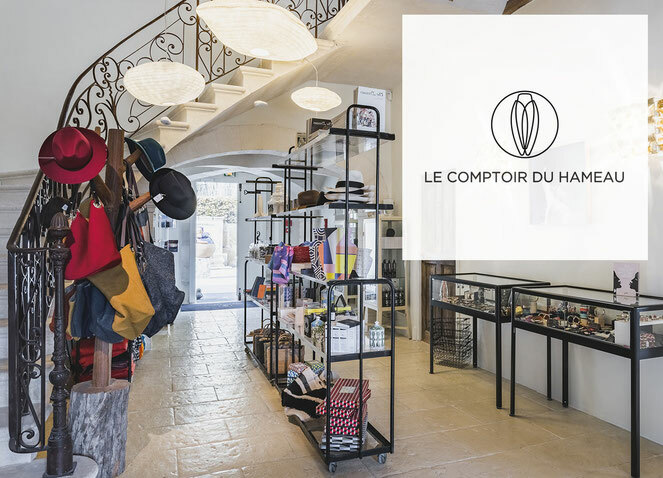 You will find all these items, and many more indulgences such as panamas, jewelry, decorative objects, soft toys… at the Comptoir du Hameau.